Regina Metal Industries specializes in rebuilds and repairs. We have machinists, welders, and millwrights who have been repairing and producing replacement parts for manufacturing equipment for over 19 years. We utilize a wide range of conventional and CNC equipment to make quick turnaround of the parts that can get you up and running again. Regina Metal Industries is the right company to make sure that your equipment efficiency, safety and repair needs are met. Serving clients in the construction, mining, refining, power generation, and other industrial sectors, we offer on-site inspection and repair services. 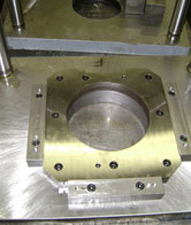 Spray welding is a coating deposition method. 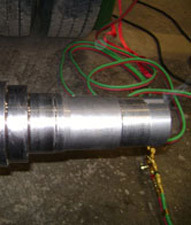 The advantage to spray welding over conventional welding is the low temperature of the process. This means less distortion and shrinking, which is perfect for seal surfaces on yokes and shafts. We provide portable line boring work for several applications, including truck housings, dozer and loader bores, boom pin holes, center articulate holes, and bucket holes. We can repair bores that are worn or “out of round” to restore them to their original dimensions at our facility or on-site. 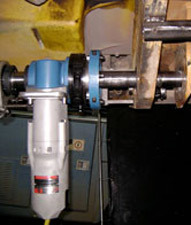 As part of our line boring service, we offer automated spiral welding which reduces repair time and costs. Regina Metal Industries specializes in small quantity and "one off" piece part work. Additionally, we are often able to reproduce or repair wearing and consumable parts for less than the OEM, helping you and your company to achieve the best return on your investment. 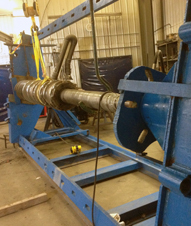 Regina Metal Industries provides re-stubbing for truck and trailer axles. We have the ability to replace the stub right on the truck or trailer, saving time and the labour costs of having to remove the truck housing or trailer axle. 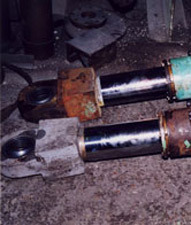 For nearly 20 years, Regina Metal Industries Ltd. has been providing pneumatic and hydraulic cylinder repair and re-manufacturing. Our repair and remanufacturing services include in-house manufacturing of all major internal components such as rods, pistons or packing glands that meet or exceed OEM specifications. Offering a wide variety of millwright and machining services we have the ability to rebuild and repair equipment at our facility as well as in the field. Our millwright services include maintenance and repair, new installation, and preservation of various types of equipment. 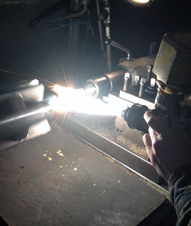 Regina Metal Industries offers dependable and efficient welding services. Our team of skilled professionals takes great pride in our excellent craftsmanship. If you're looking for quality work, you've come to the right place. We are an established company that offers a variety of welding services to meet your needs. Whether you're working on a smaller job or are heading up a major construction project, we have the tools and skills to provide the service you're looking for. 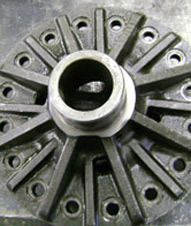 It is strongly recommended that when a clutch is replaced the flywheel should be resurfaced. This ensures the removal of any shudder causing “hot spots” and uneven surfaces. 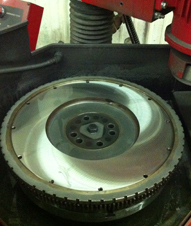 Regina Metal Industries offer complete flywheel grinding services for flat, stepped, and recessed flywheels. We can grind automotive and Import flywheels along with Mack, Cummins, Detroit, and Caterpillar Heavy duty flywheels. We pride ourselves on fast turn around and the most competitive pricing. 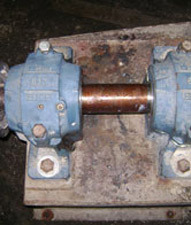 Our hydraulic presses can be used for removing and installing bushings, shafts, gears, sprockets, bearings, etc. We also can straighten bent pieces. With a 175 ton vertical “H” frame press and a 400 ton horizontal press we have huge capacity.